ALHAMBRA >> Restaurants throughout Downtown Alhambra will be chipping in for first responders over the coming week during the first “Dine Alhambra” event, officials said. 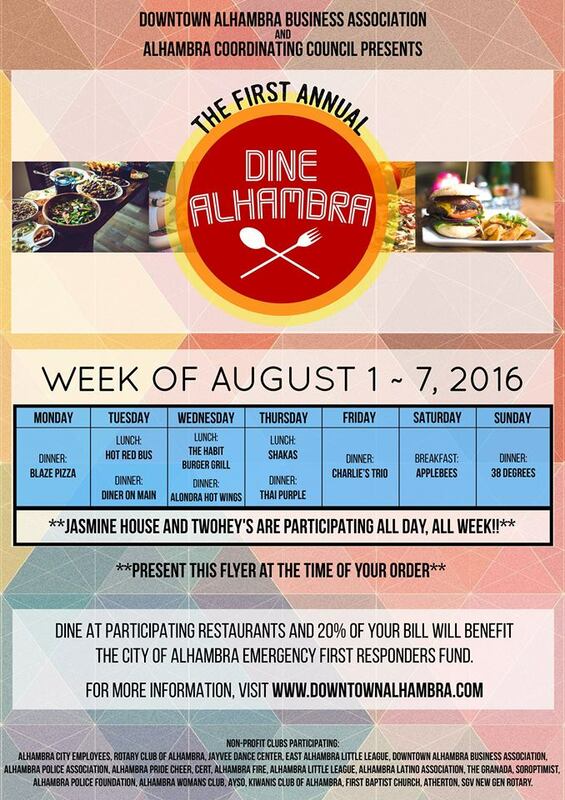 Monday through Aug. 7, local restaurants will be taking turns daily donating 20 percent of their proceeds to the Alhambra Emergency First Responders Fund when customers show the Dine Alhambra flyer, either in print or on their cell phone, city officials said in a written statement. Jasmine House and TwoHey’s will be participating all day, each day of the week, organizers said. Blaze Pizza will host the event for dinner on Monday. Hot Red Bus will host lunch on Tuesday, followed by dinner at Diner on the Main. Lunch will be hosted Wednesday the Habit Burger Grill, where Alhambra police and fire personnel will be on-hand. Dinner will follow at Alondra Hot Wings. Thursday’s lunch will be at Shakas, then dinner at Thai Purple. A dinner will be hosted Friday by Charlie’s Trio. Breakfast is planned Saturday at Applebees, and a 38 Degrees is hosting dinner Sunday evening. For more information, visit www.downtownalhambra.com.